As the nation grapples with the latest case of a white police officer killing an unarmed black man – this time in North Charleston, S.C. — a former FBI agent is offering what he says is life-saving advice. To survive an encounter with law enforcement, “find it in your heart to be humble,” Quentin Williams told a largely African American audience at Central Piedmont Community College on Tuesday. “Humility, appreciation and compliance,” he said, can be the difference between life and death. 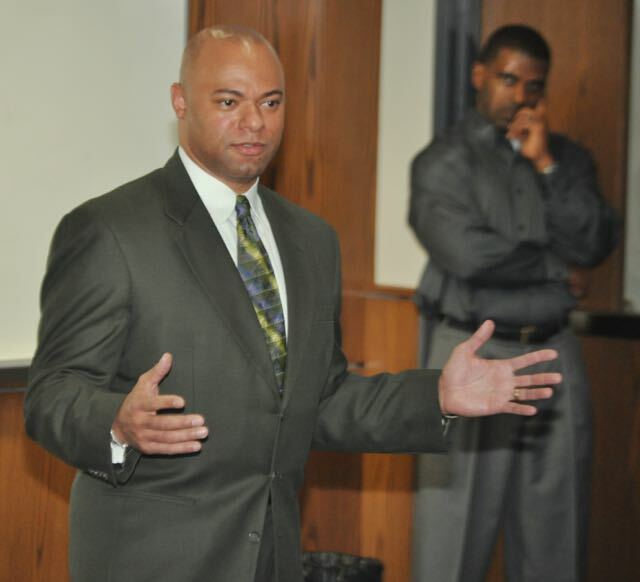 Williams, a lawyer who grew up in New York City and spent several years as an FBI agent, has written a book — “A Survival Guide: How Not to Get Killed by the Police, Part I.” He was invited to speak at CPCC by the campus organization Man Up, a minority male mentoring program. Katrina Johnson, who coordinates the program, said Man Up has held three sessions dealing with issues pertaining to law enforcement. On April 30, she said, the organization will host an “empowerment summit” focusing on the topic “all lives matter.” The public is invited to attend, she said. On Tuesday, Williams spoke with students just hours before the New York Times released a video that shows North Charleston police officer Michael T. Slager firing eight shots at 50-year-old Walter L. Scott, who was running way from a traffic stop. Scott, who may have feared being arrested on outstanding warrants for failure to pay child support, died at the scene after he was struck in the back by several bullets fired by the officer. After the video was made public, North Charleston authorities charged Slager with murder. Williams said he wrote the book three and a half years ago, long before names like Michael Brown and Eric Gardner became synonymous with police killings. The advice, he said, is based on his own numerous encounters with police. Williams said he attended Boston College during the height of the crack cocaine epidemic, a time when he and other black males were routinely stopped and questioned by police. Even after he became an FBI agent, he said, he was stopped, handcuffed, and detained for nearly five hours by an officer in Newport, Rhode Island. Williams said he and a group of friends had arrived in Newport hours earlier for a vacation. Williams said that even after he identified himself as an FBI agent, complete with badge and gun, the Newport officer refused to let him go, insisting that, earlier that day at a nearby hotel, a black man had brandished a gun while menaceing a white man. Williams said police officers sometimes act on fear, even during routine traffic stops, unsure what they are about to encounter. Williams acknowledged that his book does not deal with racism or the “predisposition” of some officers to mistrust black males. Williams said police departments nationwide must do a better job of weeding out candidates who are unsuited for the work required or those who might be predisposed to racist attitudes and actions. He told the students that, when mistreated by a police officer, their best recourse is to remain calm and report the officer’s actions to police department leaders. Q. Why is there such tension between cops and black males? It’s an us-against-them mentality. We have to get leaders of law enforcement to select and train officers in a way that allows them to understand that it’s a “we” mentality, not an us-against-them mentality. The community policing issue is large. The methodology for police has to include community policing – police officers getting to know the communities they’re policing… Leadership has to do a better job of selecting police officers who are there to serve and protect. Q. You mentioned fear. Are police justified in their fear of black males? Absolutely not. It’s a ridiculous way to approach policing. Leadership should select officers who do not have that innate fear. They should be fearful at the same level with everybody. Q. Statistics show that a disproportionate percentage of street crime is committed by black males. Does that play into this? Economics play into this. I can go to Wall Street and show you a bunch of crimes that are being committed by white males only that are ruining lives, that are stealing billions. Those Wall Street guys are committing crimes that are atrocious, but it’s not being brought to the forefront because they have the funds to dispute and to litigate and to fight it. Q. Are you comfortable living in a country where citizens must humble themselves before law enforcement simply to stay alive? I’m not saying this is right in the bigger picture. When I said that – that you have to humble yourself – I’m saying that for one particular reason. I’m saying it because my number-one goal for writing this book was to get people home safely. That’s it. Then, let’s deal with the bigger issue once they’re safe. Q. What good is filing a report alleging police misconduct? Most cops aren’t disciplined even when they kill. We have to look at short-term and long-term effects. If there is a pattern of this kind of behavior going on and you’re one little spoke in the wheel and you are making a complaint and there are a thousand other complaints, that pattern at some point could be revealed. At the very least you’re going on record that this is happening. Q. Are you simply being an apologist for bad cops? I am absolutely not justifying anything. What these extreme officers are doing, it’s completely wrong, and they need to be fired and prosecuted. What I’m trying to do is get people home. But if they don’t get home, then it’s irreversible. I don’t want somebody who should be here today, I don’t want them gone yesterday because they didn’t take actions that could have saved them. Q. Are you encouraged by the national dialogue that’s happening around the issue of police shootings? I’m only optimistic if there’s going to be a strategy. We can have all the discussions we want. We can talk about this forever. But having real creative strategies for dealing with this…that’s how we get something done.